Details of a donated quilt to CORE made by Marilyn MacLean and quilted by Michelle Palermo of Quilted Memories. Pattern: Birds on a Wire designed by Kristen Gassaway. You are an awesome lot of quilters, willing to help your neighborhood and your friends and anyone in need. As of the May meeting we have 171 quilts finished this year, (105 last year) and lots more out being quilted or pieced. The core workshop today was a true show of how everyone loves to help. We had 19 ladies arrive , ready to work. We have layered every top that we have found in the cupboards from years past and that have been turned in this year. We have lots for you to take home for the summer for when you need a change from your own projects. We have lots of kits made up ready for you to sew. We have sorted and folded and arranged all the fabric and supplies and tidied all the cupboards ready for the next team to take over. We had a lovely get together over lunch of "Thank You" pizza. It has been a great, but busy, 2 years, and we are ready to turn the task over to a new team, while we go on to other positions. If anyone has need of a Core quilt, or needs batting for a Core quilt over the summer, please contact Pat Castonguay. I will hold on to them until September. So grab a few friends and get a team of 4 or 5 together and join the Executive as a member of Core. Without Core this will be our last raffle license, a large source of income for us. So one last time, Thank You for all your help over the last 2 years, and keep on quilting! Today when I write this it is April 9th. We had another amazing workshop with about a dozen ladies working diligently. We have approximately 35 quilts layered ready to quilt. We have about a dozen kits ready to be made into tops. And we have tons of fabric and batting and thread ready to be used. May 7th will be our last workshop for this year and for this team. Leave your lunch at home, we are having pizza and pop (or water) as a huge thank you to all who can come. Our workshops this year have been phenomenal. The attendance, the enthusiasm, the team effort, has created so many beautiful hugs for our community. This week I will have delivered 157 quilts. I am sure this must be a record. The charities and individuals who have received these hugs have all mentioned how important they are to them. 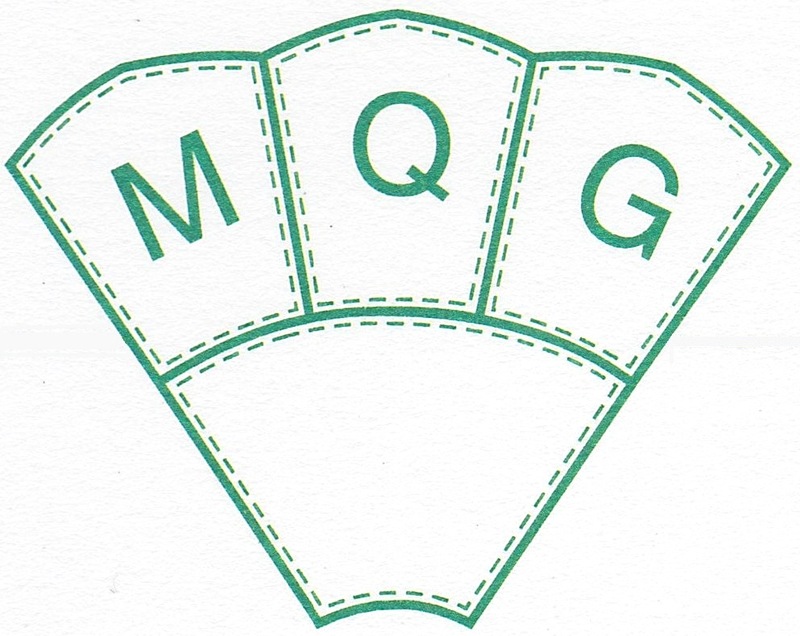 Don't forget we also have a Q Snap floor frame for use for members of the Guild. We ask for a $20. deposit because of the value of the frame, but the deposit is returned when the frame is. You can keep it for 3 months at a time, and renew if you wish. These frames are easy to assemble and light weight to carry to the cottage or somewhere to use for the summer. We will try to put it out with the Library to remind you. It is a chance to try one before buying. Please try and get a group together to take over this very essential part of our Guild. Anywhere from 3 to 6 people working together makes a great team, and you can break all the jobs down so each has a responsibility. Remember without Core, no raffle license and no raffle quilt and a huge drop in income for the Guild. Could mean a raise in annual fees if we cannot make enough income. help and support over the last 2 years. Hope everyone has been quilting their way through another miserable couple of weeks of weather., We had to cancel our workshop this week for the first time due to the last (hopefully) snowstorm, so will make our kits next month. The last 2 workshops will be April 9th and May 7th. To date we have 129 finished quilts and have delivered 101 to comfort our friends and neighbors. I will try and get another 20 out this week. It is very rewarding to see the welcome we receive when bringing in bags of quilts to the organizations or the look on someone's face when they get a "hug" for themselves or their loved one. We still have approximately 15-20 quilts layered and ready to be quilted, and a few kits ready to be made into a top. At the workshop we will make some more kits, as we had planned for this week. Core is a huge part of our Guild, and every quilt we give to someone comes from all of us. I have told many people that each square in a Bingo Quilt or each strip in a Jelly roll quilt is a person praying for them. We really need someone to come forward and take over this committee for the next 2 years. Think of buying fabric with someone else's money, making quilts just for fun and having somewhere for them to go. Getting together once a month for a workshop where everyone is buzzing around in some stage of making a quilt. And the "Happy Snack" time where we get to know each other. 3 or 4 friends or acquaintances working together is all it takes. But you need to step up now. Time is running out and without Core, there will be many, many, unhappy faces next year especially at Christmas. So see Diane or Pat about looking after this position for this next term. See you in April, for showers, no more snow. Today (February 12th) we had our monthly workshop. We had 16 ladies again, working their hearts out. We have between 30 and 40 quilts layered and ready to be quilted, they were working so fast, I could not keep track. I know we ran out of batting again, and I took 2 new rolls with me to the workshop! But our good friend Ruti had 2 more rolls for us at home waiting for me to pick up, so we are refilled for next month. We had 2 tables layering, a few ladies quilting, some piecing backs, some picking out backs, and some cutting kits. Nobody with idle hands for sure. WE also have several pairs of socks and mittens ready to drop off as well. They will be well received believe me! Our next workshops are March 12th and April 9th. Please join us and help and learn and have a fun day. Bring your lunch and join in the chatter around the big tables. It has been wonderful to see our new members joining us. A great way to meet people. Next month we are going to concentrate on making kits to piece tops. We have a few mats, cutters, and rulers, but if you are able to come and bring one great. We have lots of fabric, and are going to make up some kits for kids and adults, some I spy, rail fence, jelly roll, warm wishes??? Whatever you choose. Pick a pattern, pick some fabric and cut it into a kit to be picked up at the next meeting, or take it home with you to sew. Remember our term is finished in June, so we need a new team to take over. Come and see how it all happens, we will gladly work with you until you are comfortable. We have been working with 4, and it has worked for us. Think about it, the quilts are desperately needed in our community. Thanks again everyone for your participation in this very successful program to date. Wow!!!! We are overwhelmed! We put out the call, and boy did you respond. 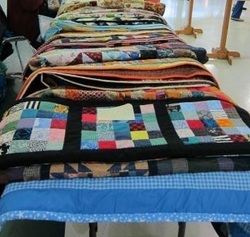 We received 20 finished quilts at the January meeting. Rochelle took them all home, sewed the labels on and they are ready when the next call comes. We also had 16 quilting angels at the workshop, 2 were new members wanting to see what we do and how we do it, and boy did we show them. We got 16 quilts layered and ready to quilt, we have half a dozen kits ready to sew into a top, and if we hadn't of run out of batting we would still be there. We have another dozen or so tops ready to layer. And we have a couple of more quilts being quilted, that I'm sure will be finished by the next meeting. We had some members could only stay till lunch, but they came and helped, and any time is appreciated. We also had a fun chat at "snack" time, when we get to know each other better. Everyone had a ball, routing through fabric, matching up backs, cutting tops, or layering the quilts. A very sociable time. Don't forget you are welcome to bring your own quilt and batting to layer on our big tables as well. The next two workshops are Wednesday Feb 12th and Wednesday March 12th, from 10 until between 2 and 3. Think about who could help you to take over this position for next year, as our term of 2 years is over in June. Then you get to shop for fabric, batting etc without having to use your own money? How much fun is that? As we start a new year we have so much to be thankful for. We all have homes, food, beds, quilts, friends, and many many other things. We hope you have all had a wonderful Holiday season and look forward to another year of quilting and companionship. But our community has great need. I had another call from The Salvation Army December 9th begging for any quilts we may have available. We had received 10 at our December meeting which I gave to them. As of today(Dec 9th) I have 1 quilt in reserve in case a member has need of a hug over the holidays. We have donated 85 quilts to date this year. Last year we donated about 115 all year. I hope some of you have had time over the last month to complete a couple of quilts for our reserve. If not, no worry , We know you will come through once you hear how desparately they are needed. Carol has also delivered 134 pairs of socks generously donated by you all to Our Place Peel along with the excess toiletries that Joan could not use, such as the make up cases etc. They were extremely grateful. We wish you all a wonderful, properous, productive and healthy 2014, and we thank you all for your support over the last year. The next workshops are Jan 15th and Feb 12th. We hope to see you there, with your lunch and helpful, willing hands. Don't forget to think about volunteering for this position next year, we will be there to help you, and if you volunteered now, you could work with us the last few months and get a feel for the position before taking over. Thanks for all the quit donations this month! We have to give a HUGE THANK YOU to all of our members for their amazing contributions to Core. 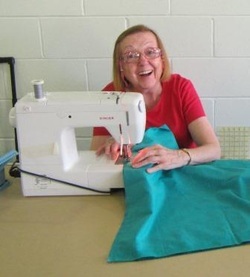 You are an incredible group of very generous unselfish quilters who have donated your fabric, your time and created so many quilts for our community. We have received 75 finished quilts as of the November meeting, and have delivered 30 to the Childrens Aid, 21 to the Salvation Army Family Services, 11 to Salvation Army Womens Shelter, 4 to Mississauga Flood Victims and 1 to a silent Auction. And that is in only 3 months. 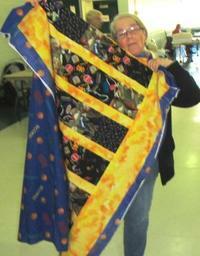 We had 10 quilt fairies at our workshop this month and have lots of quilts layered and ready for quilting. Due to space restrictions at the Dec meeting, they will not all be out, so please ask if you would like one or more to take home over the holidays. We also received 24 quilt tops at just the November meeting, that now will be layered and be ready to be quilted after our January workshop. Don't forget we are not having a workshop in December this year, we all need a break. But the next 2 workshops will be Jan 15th and Feb 12th. Bring your lunch and have a fun day. Remember you are welcome to bring something of your own to work at, especially to layer a quilt since we have the big tables set up, it makes it much easier for you. Please remember that our term in this position is over in June, so try to put together a couple of friends or acquaintances to take over for the next 2 year term. This is a very worthy and rewarding part of our guild. And there are always lots of members ready to help you. There is an incredible need hidden in our community. those in need could be your neighbors or friends. Carole, Carol, Rochelle and Pat all wish you a very Merry Christmas and happy and healthy and prosperous 2014. Once again we had a phenomenal Core workshop. 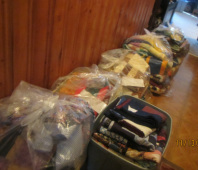 16 ladies came and sorted fabric, cut kits, layered quilts, sewed backs, or did whatever needed to be done. 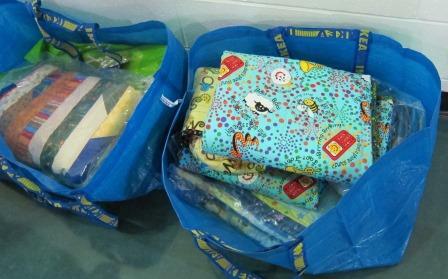 We have quite a pile of quilts and kits ready to go. And a great get together around the lunch table. It's a great way to get to know our fellow guild members. 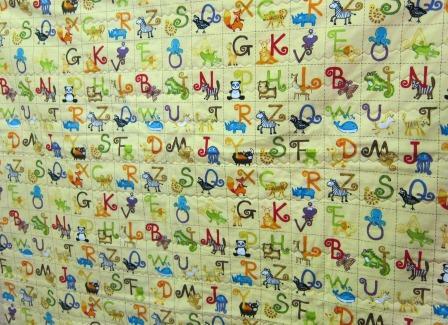 We also have about 50 completed quilts ready to deliver. Our next workshop is Nov 6th, then Jan 15th. We are not meeting in December as we have to get the quilts delivered , and everyone is busy with family and holiday events. When I got home I had a message from the Salvation Army Shelter asking if they can get some quilts before Christmas again this year, so the need is still there. We are accepting socks for teenage boys and girls and will deliver them before Christmas. This is also an ongoing need at Our Place Peel and at The Salvation Army Family Services. If anyone wants to make their own quilt kit, just let us know what fabric you would like and we can prepare a package for you. Including backing and batting if you know the size. We thank you all for your participation and for your generous donations of time and fabric. Unfortunately we cannot accept any more fabric temporarily, as the cupboards are very full. I have included a couple of pictures from this months workshop, are the ladies hard at work, or are they just having fun??? We want to welcome everyone back after our summer break and thank everyone who made some quilts for Community Outreach. As you all know, these quilts are desperately needed throughout the region. Over the summer we gave out 5 quilts to local residents who lost the use of their homes through flooding during that terrible storm. One of our own members was affected and will have her in laws living with her for several months as their house is uninhabitable. She was able to take an armload of quilts and hand them out to her neighbors and give them something of their own until they can get back into their own homes. We hope that we can supply as many quilts as last year, since in our opinion, we were very successful giving out 105 quilts and starting this year with 15 quilts on hand. We are going to try and make some kits using up some of our boxes of scraps and fabrics on hand at our workshops. We usually accept donations of fabric but PLEASE only 100% cotton, and big enough to be of use in a quilt top. At the moment, our cupboards are full! Please give us some time to use our current stash. The workshops are on Wednesdays from 10-2 (approximately), with a break for lunch. We supply hot water and tea or instant coffee. The workshop dates for the year are as follows: Sept 11, Oct 9, Nov 6, Jan 15, Feb 12, Mar 12, Apr 9, and May 7. We have cut the workshop in December due to expense and attendance. Unfortunately, we cannot have workshops on Saturdays or evenings due to expense and scheduling conflicts. We hope you understand and will continue to take quilts home to work on. position for next year as our term will be complete.